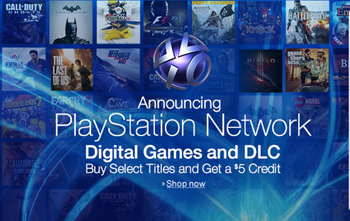 You can also receive a $5 promotional credit for the Amazon PlayStation Network store when purchasing select titles from the storefront. Amazon has launched its own PlayStation Network storefront for US customers who want to buy download codes for PS4, PS3, and Vita content without going to Sony's PSN store. In a press release, the two companies revealed they had teamed up, and it's unclear if the agreement means Amazon will mirror Sony's PSN prices or set its own prices on Amazon. With the PS4 launching this Friday and Amazon's buy two get one free promotion starting at 9 a.m. PST and ending at 1 p.m. PST today, Amazon's PSN storefront arrives at a good time. In addition, from 9 a.m. PST to the same time tomorrow, when buying select games and season passes for Assassin's Creed 4, Batman: Arkham Origins, The Last of Us, and Battlefield 4, you receive a $5 PSN credit redeemable at Amazon. For these select titles, if Amazon's prices are cheaper than Sony's, it's only by four to 20 cents. There are many other titles up for buying digitally, as well. The store is stocked with over 100 items right now, and it will add additional titles as they are released elsewhere. The purchase of digital copies is still a bit shaky for some consumers as we were led to believe a fair amount of the price of physical games came from the cost to package the game, and yet digital copies cost the same as physical copies and lack the ability to resell a disc or easily loan it to a friend. If Amazon can break away from Sony's resistance to lower prices on its own PSN storefront, maybe there will be more incentives to buy digital on Amazon.